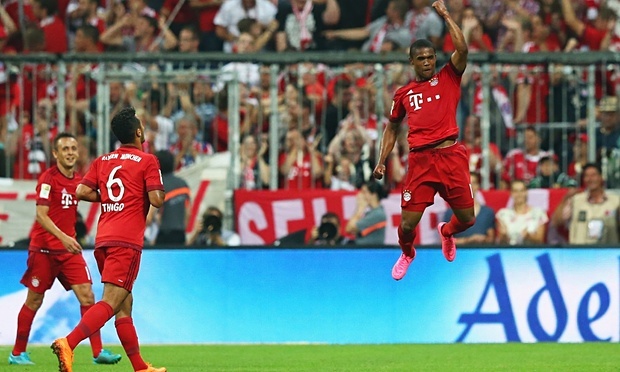 Bundesliga is back in all its glory and another great start by Bayern Munich. The German record champions started off the season on Friday night in style as they thrashed Hamburg by a 5:0 score. HSV held on for as long as they could, before the wheels came off in the second half in a game that was never in doubt from the opening whistle. The match started with Bayern applying constant pressure to the Hamburg goal, aiming to please the sell-out crowd at the Allianz Arena. The Bavarians seemed very comfortable on the ball from the start but HSV made sure to play very tight in the back, in hopes of preventing another 8:0 debacle at the hands of The Rotten. The breakthrough came in the 27th minute as Medhi Benatia headed the ball in the back of the net from a fine Xabi Alonso free kick. Bayern applied more pressure off the wings throughout the first half, both Arjen Robben and new signing Douglas Costa causing constant problems to the Hamburg defense, yet the scoreline only read 1:0 at the half. Second half started the same way the first one ended – in the direction of Rene Adler’s goal. Robert Lewandowski scored from 10 yards out in the 52nd minute following some sloppy defending from Hamburg, which all but killed any hope of a comeback. Costa is adapting very quickly to life in Munich and the 3rd goal by Thomas Muller had everything to do with the pacey Brazilian. He skillfully stopped the ball from going out of bounds on the right hand side twice before calmly sending an outside off his left foot cross into the five yard box, where a galloping Muller headed the ball in the net to the delight of 75,000 spectators. Four minutes later Muller was at it again. Lewandowski trapped the ball just outside of the box and sent it through to Muller, with the German superstar having enough composure to get around the keeper and finish it home with his left foot. Costa finished of his impressive Bayern debut and certainly earned his man of the match honors with a goal in the 87th minute. He collected the ball inside the box, following another awful defending by Hamburg, made a quick move to his left and unleashed a well placed finish into the left corner. Bayern looked and played like a team that will hoist yet another Bundesliga title at the end of the year. The quality throughout the team is something no one else in Germany can compete with – at least not on paper. Wolfsburg, Dortmund, Leverkusen and Gladbach will all look to push the Bavarians. Unless they suffer numerous injuries to key players there is simply too much talent there for anyone else to spoil their 4th consecutive Bundesliga title. Srdan “Sojo” Latinovic is a sports editor/writer with previous writing experience for Chicago.com, Bleacher Report and Suite 101. He has covered soccer, basketball and hockey among other sports and also has keen knowledge in tennis and football. Sojo has played competitive sports since he was 5 years old and still does to this day, although the level of competition has dropped since his semi-professional days of soccer in Germany in the late ‘90s. Sojo is a 2009 graduate of Columbia College Chicago with a degree in Sports Journalism and is a recipient of the 2009 Society of Professional Journalists Mark of Excellence Award.